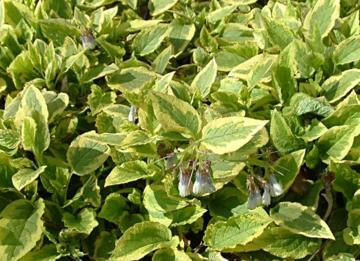 Spreading, rhizomatous perennial with variegated leaves of green boldly marked with yellow and cream at the edges. Cymes of pale blue, cream or pinkish flowers in mid and late spring. Grows best in moist, reasonably fertile soil in partial shade or full sun if not too dry. Adaptable to most soils and a range of conditions. For best foliage effect, remove flowering stems.